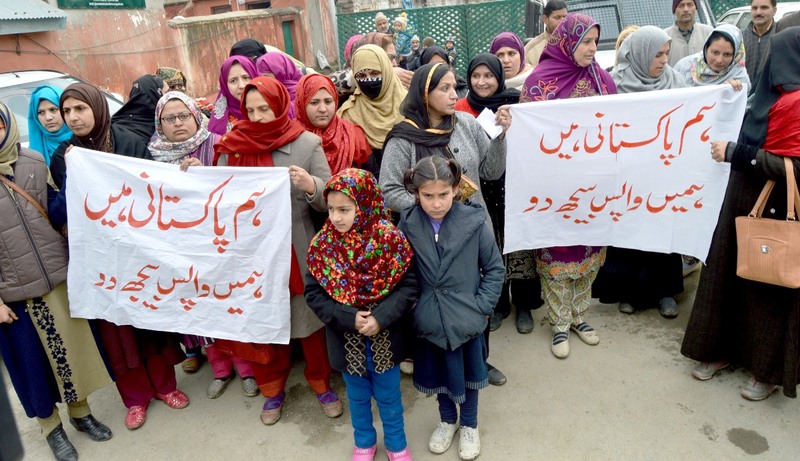 SRINAGAR: Around twenty Pakistan origin women, who had accompanied their Kashmiri husband’s home under the return and rehabilitation scheme 2010 announced by then chief minister Omar Abdullah, held a protest in City centre on Saturday to seek formal citizenship and permission to visit their parents. The protest came on the eve of Prime Minister Narendra Modi’s state visit on Sunday. Protesting women, some in visibly bad shape, appealed to the Prime Ministers of India, Narendra Modi and his and Pakistani counterpart, Imran Khan, for their free travel to Pakistan. 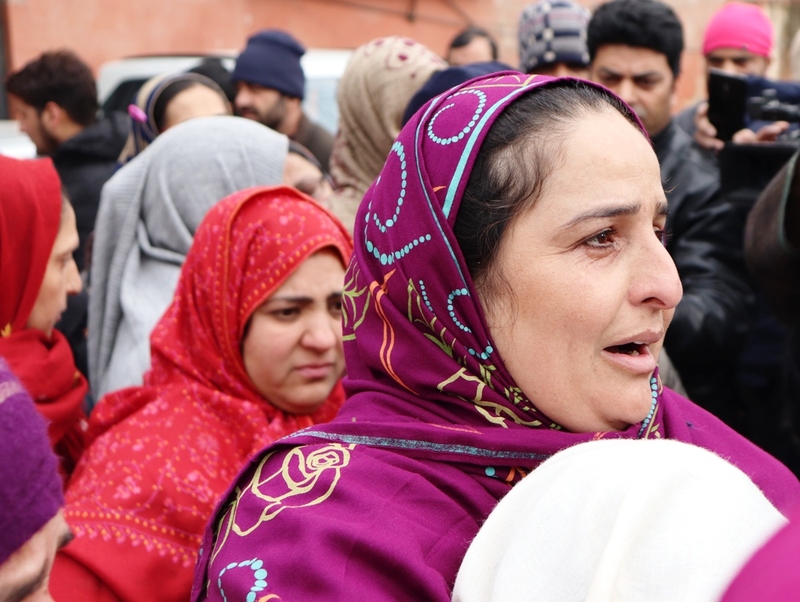 Out of the 350 families that returned under this policy, around 50 women have already been either widowed or divorced and are in Kashmir without any support, they said. Qubra Geelani, a resident of Muzaffarabad Pakistan who got married to a Kashmiri in 2010 and came to Kashmir with him in 2014 was demanding that she should be allowed to go home. She was divorced by her husband in 2018 and is suffering enormously as she has no relatives in Kashmir and knows of no one she can live with. “I have been struggling a lot to go back to my home in Muzaffarabad but despite having all valid documents, I am not allowed. I have to face a lot of problems and I am currently living with a Kashmiri family at Pattan,” she said. She is persistent to go back anyhow. She feels grateful that other women from Pakistan have gathered here in her support and wishes that they all can go freely to visit their families. “I approached the administration as well as Hurriyat leaders but I got no positive response from them. I even went to Wagha border but was denied to go further. I won’t stop this struggle till my last breath,” she said. These women, who had come as bride accompanying their husbands and children, belonged to various places of Pakistan like Punjab, Rawalpindi, Lahore, Karachi and many areas of Pakistan administered Kashmir. They said they should be allowed to meet their families across the border. The policy that was projected as a major CBM envisaged an amnesty to Kashmiri youth who “had crossed over to PoK/Pakistan for training in insurgency but have given up insurgent activities due to a change of heart and are willing to return to the state.” It was applicable to everybody who had crossed over to the other side between January 1989 and December 2009. The policy document suggested that “wives, children and other dependents of those returnees who have married in PoK/Pakistan during the period 1.1.1989 to 31.12.2009, will be considered for entry into the country as per the existing laws of the land and the necessary certificate for entry will be issued to them”. Once home, however, they said they were deceived. After arrests, registration of FIRs and series of de-briefings, they alleged they were denied the basic rights that would make their lives comfortable. “It has been seven years now and we have not met our families. Even if our father, mother or a siblings dies we are not allowed to be the part of their funeral or mourning. We are helpless and no pain is greater than this,” said Safiya, while tears were rolling down from her eyes. Saira Javed, one of the Pakistan origin Kashmiri bride breaks down during the protest. They said this painful longing from their families for so many years has led to the vanishing of their peace of mind and they are living a miserable life. Many of them have developed various health issues like depression and anxiety. Some of them have even committed suicide. “Many women died with the desire of meeting their families and we don’t want to be one of them,” said Aasiya. There are many of them who have been divorced by their husbands and now they have nowhere to go and it is impossible for them to survive in such conditions. These women who are presently living in Pulwama, Baramulla, Shopian, Kupwara, Bandipora and other places in Kashmir requested the government of India and Pakistan to look into the matter and solve their issues as soon as possible by providing them with the passport and other legal documents required to visit their country. Imrana Meher said the government must provide travel documents to all of them and help those get home permanently whose husbands have died or who are divorced. Most of these women said they came in response to government policy and were advised to come through Nepal and not the twin routes that connect the two halves of Kashmir. The policy has not been in operation after the BJP government took over in Delhi.